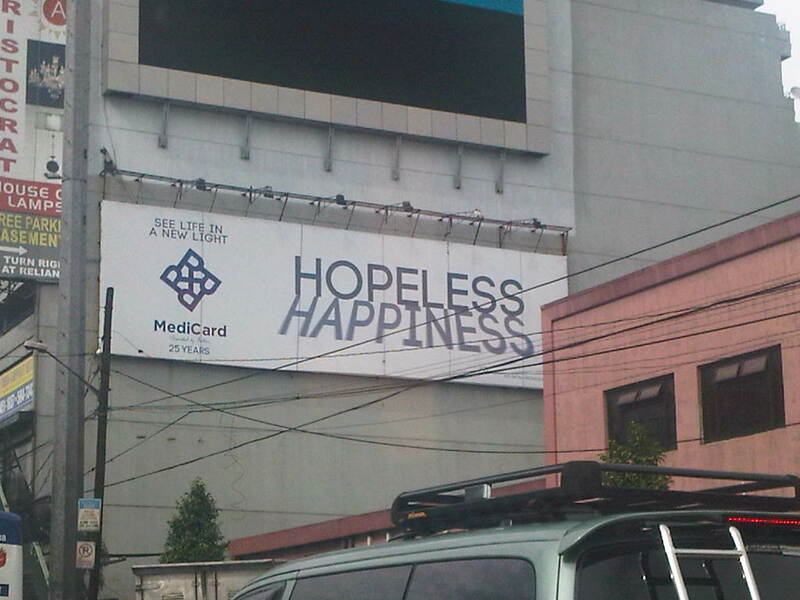 So When I first saw that sign, I was confused: wait, why would a company – in health insurance at that – want to sell hopeless happiness?! Lesson here: it’s not enough that we triple-check our marketing materials and copy. We have to TEST them with other people. It’s not enough that it passes our own paradigm. Oftentimes, we are too close to the material that we don’t get to see what the everyman will get to see. No need to hire an expensive marketing research firm. You can start by sending the copy to 20 different friends through email and ask for suggestions (people love to give their opinion in stuff like this). Post it in Facebook for a few friends. Grab a projector, project it on the wall and let the whole office comment without you rendering judgement. Test. Test multiple versions and make people choose. More importantly, try to simulate the actual medium the copy will be reflected in. If it’s website copy, don’t show it to people in Word format, plug it in a Powerpoint presentation which simulates the website to be developed. Next PostYou can choose your own adventure!